It was the worst time to have an appointment between 3 – 4 pm today. The rain started suddenly and within 15 minutes, there were lightning and thunder. The wind was very strong as well. There was no way you could prevent yourself from getting wet and it was pure insanity to even think of getting out into the rain. But too bad for me, I needed to get to my daughter’s school to celebrate her birthday at 3pm. And I also have to bring a huge bag that contained her birthday party goodies bag. So it was me in the rain. One hand holding the bag, the other holding the umbrella. Mr Wind was pretty busy trying to get my umbrella to divorce me in the rain. By the way, how do you get into a car without getting wet when you have an open umbrella? Do you place the umbrella between the car roof and car door and try to close it, pull it in as quickly as possible? The rain water will nevertheless still drip onto your clothes right? Or would you try to close the umbrella in the rain and quickly jump into the car and throwing the wet umbrella onto the passenger seat? I never quite figured out the best way BUT I really need to master this skill because there are no sheltered carparks within the Tiong Bahru Estate! Anyway, my entire jeans, socks and shoes were soaking wet when I arrived at her school. And guess what…..my wife told me she forgot to bring another bag of goodies bag and sent me home to retrieve it. I think she knew that I needed more practice on how to get in and get out of a car with an umbrella. By the time I got back to the school again, my mood was quite in sync with the weather. When it was time to leave the school, the rain had eased up but it made no difference to me anyway. I was already soaking wet by then. This afternoon sudden down pour did claim a victim in Tiong Bahru. A tree next to Block 50 Moh Guan Terrace fell. Luckily no one was hurt. Anyway, who would be out walking in the rain right? I saw the fallen tree at about 4:30pm and by 6pm, the tree and all other debris were thoroughly removed by the Tanjong Pagar Town Council. If you were heading home this evening and you walked past that spot, you may not even have noticed that there used to be a tree that stood there. GREAT JOB Tanjong Pagar Town Council, you are super efficient. Doesn’t our food smell, too? I am dedicating today’s post to all the foreign workers who are living amongst us within the Tiong Bahru Estate. I refer to media reports on concerns about foreign workers in Singapore. I find it very disturbing to hear the increasingly prejudiced views expressed in public about foreign workers, especially construction workers. At a meeting recently with a Member of Parliament and local residents, a well-dressed Singaporean woman raised the “problem” of foreign construction workers. When pressed, she admitted that they had never done anything to her but seeing them in her area disturbed her. “They may cause crime,” she said. The other residents nodded in agreement. A senior policeman pointed out that foreign workers in the area rarely commit crimes and that most of the culprits were pub crawlers. But no one wanted to drop the idea that foreign workers were trouble. The policeman had no choice but agree to keep a closer eye on them. •Too many of them live in one apartment. Here’s a thought: Would Singaporeans be able to afford to live any better if they were paid the same wages as some foreign workers are? Doesn’t our food (fried fish, belacan and durian) smell, too? Are we so parochial that we only object to smells that are different from our own? • They hang their clothes outside to dry. A walk around any housing estate will show the many laundry poles outside our flats, attesting to the fact that Singaporeans hang their laundry out to dry as well. • They hang out in large groups and that’s scary. I think our prejudices are far more frightening than a group of men finding company in numbers when far away from home. • They don’t speak English. It’s unlikely that they can afford the time or money to take English language classes. If this is really an issue, the Government could make it mandatory for employers to provide all foreign workers with two-hour English language classes every week. It seems perfectly fine for foreign workers to work long hours with low wages to construct the buildings that drive our economic boom. But many of us fail to remember how difficult their daily lives must be. This mindset does not speak well for multiculturalism. It isn’t enough for Singapore to produce tourist brochures showcasing us as a harmonious, multi-ethnic society. This attitude needs to be part of our daily lives before it becomes true. Let’s start with the way we think about foreign workers. Singaporeans risk taking their culture or historical heritage for granted in a rapidly changing world, Minister for Community Development, Youth and Sports Dr Vivian Balakrishnan said. Speaking at the opening of the National Library Literary Heritage Showcase, the minister called on Singaporeans to develop a sense of history and appreciation of their heritage. The showcase, which includes a series of exhibitions that outline Singapore’s rich history including pioneer artists and Chinese clans, also features the second run of the Heritage Road Show. The public are called upon to donate their photographs, postcards, pictures and other items to capture the memories of Singapore before 1970. Donations of old report cards, school magazines, menus, invitation cards to official events, programme notes of concerts, bus tickets, maps, manuscripts, certificates, awards and the like are also welcome. The availability of this deposit website means that local publishers can submit their published works digitally. The National Library Board will be sending out details to publishers to access the website within the next two months. The showcase runs until November 28 at the National Library. I READ Tay Suan Chiang’s story (Pieces Of Singapore, Life!, Nov 3). It brings to mind the SIT flats in Tiong Bahru which hold many fond memories of younger days for many Singaporeans. I remember returning from my studies in Britain and feeling overwhelmed by the sight of these flats. I felt I had arrived home. Their architecture is unique. Not long ago, two architectural students from Sweden begged me to let them in to view the interior of the flat. The buildings are characterised by the round stairway balcony with a porthole at the side, and the sheltered five-foot-way. The Tiong Bahru market blends in beautifully with the neighbouring blocks and the town council has done a wonderful landscaping job. In Yunan, China, the government preserved the Old Town of Lijiang and it is recognised as a Unesco preserved site. Can the same be done for Tiong Bahru? 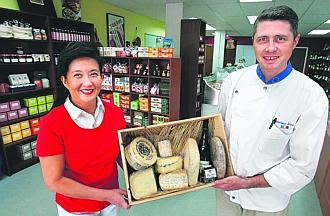 MARCHE CACHE: Shirley Tang and Stephane Herve invite you to sample their wares, like the Emmanuelle Baillard juices and nectars and the clementines in vanilla syrup. With so many gourmet shops popping up all over the island – selling meats, cheeses, vegetables, fruit and gourmet groceries – it is quite possible to do like chi-chi Europeans do and patronise only small shops. The latest one to open has all the fixings for dinner and then some. At three-week-old Le Bon Marche in Tiong Bahru, you can get some plump chicken, luscious San Marzano tomatoes on the vine, French cheeses, anchovies from Barcelona and premium smoked salmon – champagne-glazed no less – from French brand Labeyrie. Soon, there will be Donegal oysters from Ireland. The shop is run by Stephane Herve, 37, who was a chef at various restaurants and a food division manager at gourmet chain Culina. He and his wife Shirley Tang, also 37, provide the kind of friendly, knowledgeable service lacking in Singapore. Try some nectarine juice, they’ll say. Want a taste of anchovies? How about some cheese? Shopping here is such a pleasure, with new things to discover on every shelf. I highly recommend the Emmanuelle Baillard juices and nectars. For people who don’t want to drink wine with dinner but want something more exciting than water, try the Chardonnay grape juice ($6.50 for a 250ml bottle). It is pressed from the same type of grapes used to make the wine and the non-alcoholic juice has a light, floral scent that’s quite irresistible. The raspberry nectar ($6.90 for a 250ml bottle) has a deep berry flavour which makes it a great cocktail mixer. 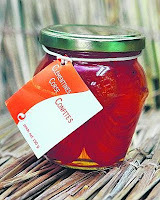 I also like the clementines in vanilla syrup ($13.50 for a 150g jar). The slices of small mandarin oranges taste so tangy and fresh on buttered toast. Or use them to top a lemon curd tartlet. If you like gingerbread, pick up some Mulot & Petitjean gingerbread with apricot ($21 for a 200g box). The little round cakes are lightly and aromatically spiced. Bite through the thin shell of cake and the decadent apricot jam starts spilling out. Tiong Bahru has always been a magnet because of its old-style architecture and the great food served in atmospheric coffee shops. Herve says it was this charm that drew them to the neighbourhood. I’m hoping they stay a while. Le Bon Marche, 78 Guan Chuan Street, 01-41, tel: 6226-3269. Opening hours: 10am to 7.30pm (Mondays to Saturdays), 11am to 5pm (Sundays). Closed on Wednesdays. Right next door to Le Bon Marche is a cake shop with a screaming pink and white sign. Walk into Centre Ps (pronounced centrepiece), and you’ll find another very pink wall. I’ve never been so glad to see dark brown from the dark chocolate used in the rather fancy-looking cakes in the display case. They are the creations of pastry chef Steven Ong, 39 (above), who is letting his imagination run wild and free after leaving the hotel industry, where he’s worked for 20 years. The unfettering was a good thing too. D’Tanjung Katong ($7 a slice), named after another old, charming area of Singapore that he likes, has a dark chocolate ganache and sweet, chunky bananas in between layers of coconut dacquoise. I like how the bananas still have bite and provide a sweet counterpoint to the dark chocolate. The cake sounds terribly rich, but it isn’t. Dark chocolate fans should try the Grand Cru Royale ($7 a slice) – a deeply chocolatey cake on a crunchy hazelnut base. I’ve eaten more ethereal macarons ($18 for a box of 18) but I am going back for the chocolate and cafe creme ones. The violet one, in a bright blue hue, is fantastic. 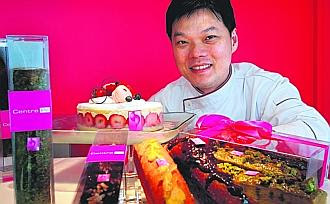 Ong says he’s happy to customise cakes for his customers. He also has a terrific sugee cake, made originally for a resident in the neighbourhood who used to go to the East Coast to satisfy her craving. I had a taste of one of these cakes warm from the oven, and it was a springy, buttery thing. Soon, the shop will also offer quiches, pies and pissaladiere, a Provencal-style pizza topped with caramelised onions, olives and anchovies. Centre Ps, 78 Guan Chuan Street, 01-43, tel: 6220-1285. Opening hours: 10am to 8pm (Mondays to Thursdays), 10am to 9pm (Fridays and Saturdays). UNIQUE FLATS: Katong Hostel will preserve the buildings’ heritage, as they are among the early batches of flats. A COMPANY that has just won an HDB tender in a pilot scheme plans to rent out 120 flats at Tiong Bahru for up to $4,500 a month to foreign students and expatriates. It is the first step to boost the supply of flats in the rental market amid growing demand. It aims to put flats vacated under the Selective En Bloc Redevelopment Scheme to better use. 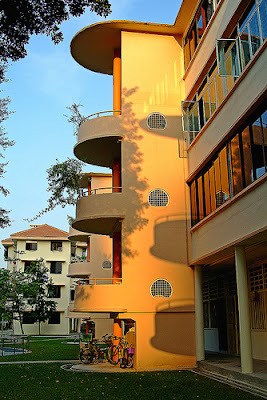 Former residents of the 120 flats have moved to new and better flats nearby. The HDB said the flats that had been vacated were identified for its rental scheme, pending long-term development plans. The Tiong Bahru flats will get a $3 million facelift and be ready for tenants by the year’s end. 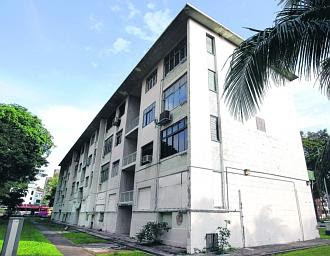 The winning tenderer, Katong Hostel, which provides international student housing, will be the managing agent for the 60 three-room and 60 four-room walk-up flats. The firm, part of the privately-held Vita Group of hostels, plans to rent out at least two blocks to students and possibly the rest as service apartments to expatriates. Katong Hostel won the tender with the highest bid of $230,280 a month, 22 per cent above the next bid of $188,000 a month. That price is the sum the firm will pay HDB to lease the flats for three years, with an option for three more years. Katong Hostel aims to rent out these flats – Blocks 1, 3, 5, 7 and 9 in Tiong Bahru Road – at a relatively high price of between $3,500 and $4,500 a month. While rents in the Tiong Bahru area have risen significantly, the HDB flats there have so far achieved only up to $2,500 a month in rent, said HSR property group’s executive director Eric Cheng. But the Tiong Bahru flats are different in that they will be managed and aimed at a specific clientele, said Ms Joyce Sim, 25, a Vita group director. She said the student housing – to be charged on a per person basis with two to a flat – is aimed at those looking for quality housing. These could be doctorate students, for instance, who could be paying their own fees or sponsored by firms. You are currently browsing the Tiong Bahru Estate blog archives for November, 2007.